What if you are standing in an elevator and suddenly its floor tiles fall off ??? Simple use of a multiple TV screens by LG, with sticker tapes to give a GRID like feeling as seen on floor tiles. 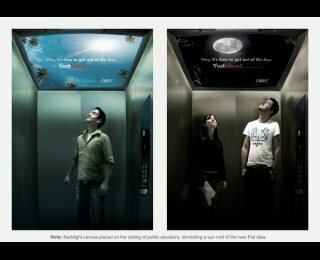 This is scary if you are not aware of such unusual elevators. Similar screens can be used to display news or important information of the building ( hotel, commercial complex or offices ), while you move from floor 0 to floor 58.